Xiaomi just launched the Redmi Note 7 in China and the company is reportedly working to bring the phone to India soon. Alongside the Redmi Note 7, Xiaomi is also expected to launch the Redmi Note 7 Pro and Redmi Go Xiaomi’s Android Go phone in India by the end of Q1 2019. Then there are phones like Mi 9, Mi Mix 4, Mi A3 that are also in the pipeline. Alongside these phones, Xiaomi is working on a special phone to launch later this year. It’s the Xiaomi foldable phone. Earlier this month the Xiaomi foldable phone was leaked in a video, but there wasn’t any confirmation from the company’s side. But now Xiaomi has confirmed that they are working on a foldable phone which will be launching soon. The company has leaked a video showing the prototype of its foldable phone. The video shows that the Xiaomi foldable phone will work like a tablet as well as a smartphone. Notably, as Xiaomi said it is just a prototype for now which means the final design of the foldable phone will be pretty different than what the video shows. The same prototype could be showcased at the MWC 2019 next month. The video shows the Xiaomi foldable phone from all sides and it looks pretty elegant with slim bezels on all edges. Considering it isn’t the final production unit the edges aren’t as polished as it should have been. We expect the final version of the Xiaomi foldable phone to be smoother and curvier from the sides. 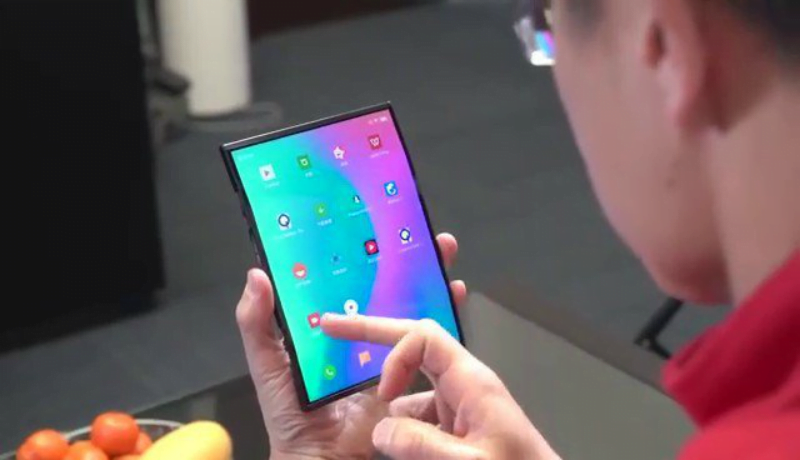 In the video, the Xiaomi foldable phone is being used by the company’s President and Co-founder Bin Lin. Lin uses the phone as a tablet and also as a phone. To use the Xiaomi foldable device as a tablet, the user needs to open the sides while to turn the device into a phone the device has to be folded on to the sides. The size of the tablet as well as the folded phone looks pretty perfect. The video further shows that the Xiaomi foldable phone runs MIUI interface. We expect it to come with MIUI 10 or the MIUI 11 which is to go official very soon as Xiaomi is currently working on it. Xiaomi posted the video of the foldable phone prototype on the Chinese microblogging site called Weibo. In the video, Xiaomi has revealed that the company has been working on the foldable phone for quite some time and faced a lot of challenges to build the current design. It faced issues with the folding technology, MIUI adaption and many more. Xiaomi has also confirmed that the foldable phone will go official very soon. Considering Samsung and LG are expected to launch their respective foldable phones this year Xiaomi could also follow the same line. Xiaomi is yet to reveal official details about the launch timeline of the foldable phone. Besides showing the prototype of the foldable phone, Xiaomi is also asking consumers for recommendations to name the phone. This suggests that the Xiaomi foldable phone launch is imminent.